Safety is a choice, not a chance. 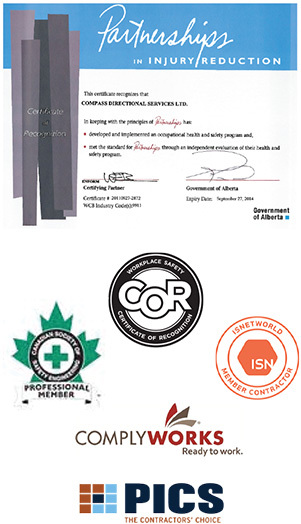 Compass holds Alberta Certificate of Recognition (COR) and is committed to maintaining a strong health and safety program that ensures a safe, healthy workplace for our employees, contractors, associated service providers and visitors. We are committed to ensuring all applicable legislation is incorporated into our safety program and to complying with that legislation. Employees at every level, including management, are responsible and accountable for the company’s overall health and safety initiatives. Complete and active participation in the program is required for all employees and contractors. Program initiatives are communicated through training, procedures, alerts, management site audits, safety meetings and printed materials. Management is also committed to supplying safety equipment to all employees to support a safe work environment, increasing awareness and improving safety measures at every opportunity. A healthy and safe workplace is our goal. Through continuous safety and loss-control efforts, as well as regular review of our practices, we can accomplish this. All employees and contractors are familiar with OH&S acts and regulations. Our health and safety policies and procedures do not take precedence over OH&S regulations. Compass is COR-certified and listed with ISNetworld, ComplyWorks and PICS.